Search Leesburg MLS right here. Our team is dedicated to making the buying and selling of Leesburg real estate in Northern Virginia a satisfying and rewarding experience. Our website allows you to search all active Leesburg homes, townhomes, & condos. This site is easy to use and navigate through property searches to find the most accurate information available. You can also save searches and get daily email alerts of new listings as they become available. Situated in the foothills of the Blue Ridge mountains, Leesburg is know for its natural beauty, historical significance, and its recent explosive growth. When searching for Leesburg Real Estate, know that this area is centrally located to both the economic engine of Northern Virginia and the lush countryside boasting some of the best vineyards on the east coast. You can find both the old town charm of downtown or the suburban lifestyle when searching for Leesburg homes for sale. Leesburg is an amazing small town with shops and restaurants throughout the downtown district with beautiful homes peppered in the downtown landscape. You can also find some great Leesburg homes with acreage all the way down to townhomes and condos in the surrounding neighborhoods. 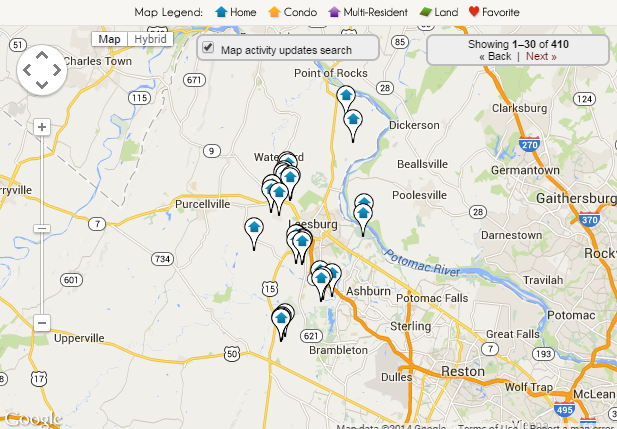 Find your Leesburg MLS listings right here in 1 easy site to search!